Julia Louis-Dreyfus says she was "very undone" on the last day of taping Seinfeld, when the iconic series ended its nine-year run in 1998. "Oh my God, that was unbelievable, I have to say," she said. "Talk about nostalgic. You know, I think we were all caught by surprise by how emotional we felt. We used to do this thing before [the shoot]. We always would come together in a huddle, the four of us [Jerry Seinfeld, Michael Richards, Jason Alexander and Louis-Dreyfus], and put our arms around each other and just do a little getting-jazzed moment together. And on this night, we all got together and we all just started to cry. And it was very surprising. And I remember Jerry saying something like, 'We'll always have this and we'll always be tied to one another, because of this experience.'" Her eyes moistening, she added: "I can't even talk about it, but it was pretty intense and it was a bittersweet day. It was beautiful, but it was bittersweet. It's hard to say goodbye to good friends." Asked if she's stayed in touch with her co-stars, she said: "Yes. We don't talk all the time. But it's really great." The actress was speaking April 6 at Loyola Marymount University's School of Film & TV, where she took part in the ongoing Hollywood Reporter interview series The Hollywood Masters. She expressed shock at the recent news that Australian prime minister Malcolm Turnbull had adopted the campaign slogan used by Selina Meyer, the U.S. president (formerly vice president) she plays in HBO's acclaimed comedy series Veep. "Can you believe it?" she said. "[These parallels] do happen often, but in this instance, this was a guy who's running for [prime minister]. He's using this new campaign slogan, 'Continuity with change or change with continuity,' which was Selina Meyer's campaign slogan. We thought it was the most empty, moronic [idea]. And he's gotten a lot of crap for it at this point. I wonder if he's changed it. He might want to. That, to me, is the most extraordinary example of life imitating art, and back and forth." 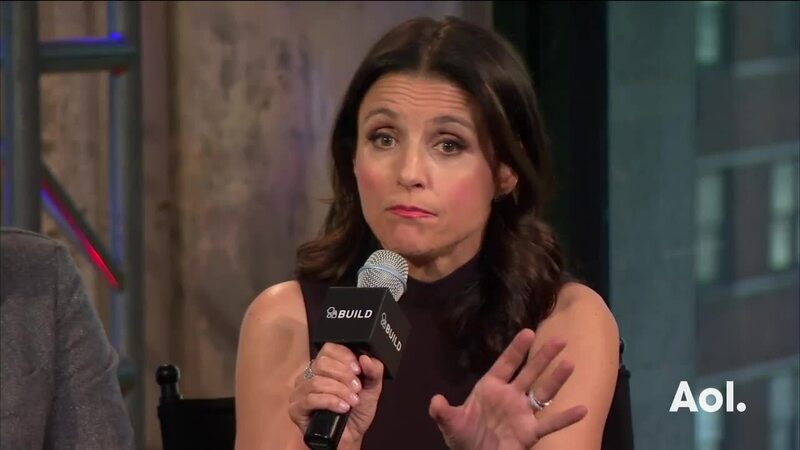 Louis-Dreyfus said the current U.S. presidential race had shifted her view of her series: "When we began Veep, we thought of it as a satire, and now we think of it more as a somber documentary." She said she did not think current politics would change the future direction of Veep, however, or the fine line she treads between satire and reality, which she compared to "threading the tiniest possible needle." "I don't think so," she said. "I mean, we're not parodying any one particular politician or party, for that matter. We've created this alternate universe on our show. But it's quite remarkable, what's going on right now. In fact, I saw the former president of Mexico on television recently, in response to [Donald] Trump's talking about building this wall: Vicente Fox was saying, 'We're not going to pay for that f-;ing wall.' On television! And I'm like, 'Huh? What's going on, man?' What happened to political discourse? Bye bye." As to her own politics, she declined to say whether she prefers Bernie Sanders or Hillary Clinton: "I'm a Democrat, and so I'm just going to be behind whoever the nominee is. Period. End of story. Tried and true Democrat." Julia Louis-Dreyfus: "Selina Meyer Could Give Donald Trump a Run for His Money"